John Roy Lynch spent most of his childhood as a slave, but the Emancipation Proclamation and the end of the Civil War promised African Americans in the South the freedom to work and learn as they saw fit. While many people there were unhappy with the changes, John Roy thrived in the new era. He was appointed to serve as Justice of the Peace and at age 25 was elected into the United States Congress, where he worked to ensure that the people he represented were truly free. This biography, accompanied by Don Tate's splendid illustrations, gives readers an in-depth look at the Reconstruction period through the life of one of the first African American congressmen. Like adults, young readers should know about the era of Reconstruction and the remarkable individuals who struggled to give real meaning to the freedoms blacks achieved during the Civil War. John Roy Lynch was one of them and he is brought vividly to life in this book. Tackling what turns out to be a near impossible task (explaining Reconstruction to kids without plunging them into the depths of despair), this keen duo present a book that reads so well you're left wondering not just how they managed to pull it off, but if anyone else can learn something from their technique. ... [Y]ou just have to stand in awe of Barton's storytelling. ... Tate puts his all into what is by far his most sophisticated work to date. Barton offers an immersive, engaging, and unflinching portrait of the difficulties of the Reconstruction era, while Tate's cartoonlike artwork softens moments of cruelty and prejudice without diminishing them. The fascinating story of John Roy Lynch's life from slavery to his election to the U.S. House of Representatives at age 25, gets a stirring treatment here. ... [C]onsistently incisive. For all that we focus on the Civil War in American history, there is far too little attention paid to what happened in the South following the Emancipation Proclamation, the end of the War, and the ratification of the 14th and 15th amendments to the Constitution. 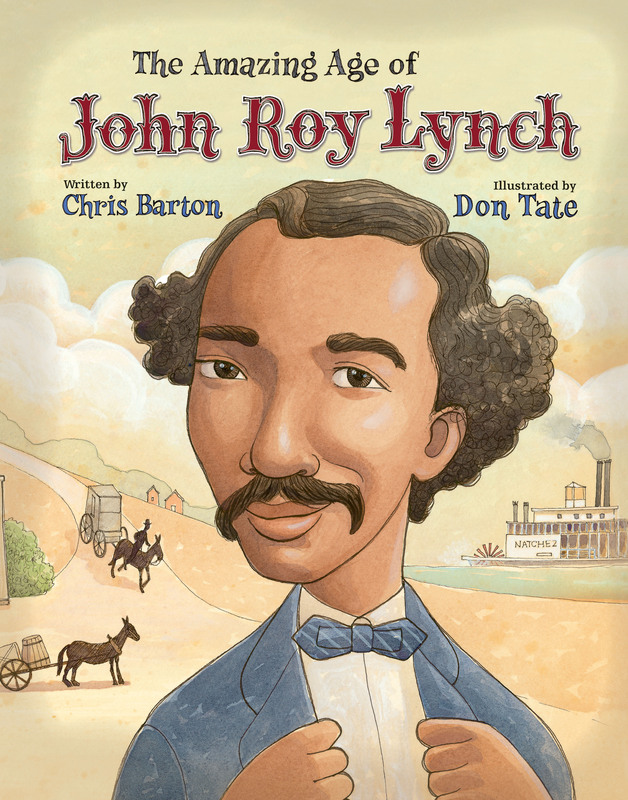 The Amazing Age of John Roy Lynch is a great introduction to Reconstruction and to one of the first African-American members of Congress. The amazing fortitude and resilience of John Roy Lynch keeps this book moving as his own life progresses in unexpected ways. ... The illustrations by Tate are done with a light touch, creating a book that depicts darker subjects at times but also infusing the book with a sense of hope and wonder. This makes a book covering such a heavy topic as well as such an important part of history much more appealing and approachable. Tate's illustrations, rendered in mixed media, ink, and gouache on watercolor paper, are extraordinary... The excellent cartoon-style paintings soften potentially disturbing details, such as the Ku Klux Klan burning a church. ... Teachers will find this remarkable story of hope and perseverance a valuable supplement to social studies lessons on the Civil War and Black History Month. The man and his story are amazing, and it's a story all children should know. But what is equally amazing is the telling. ... I can't recall when I've seen a book for children that is so deliberate about calling out racism for what it is. And [Barton] does it with such clear, simple language, making this complex period in history accessible to young readers, just as Don Tate's clear stylized illustrations do. This is not an easy read -- but it's engaging, compelling, and perfect for starting discussions with kids. Not only do I believe children can handle tough discussions, I believe we owe it to them to teach them to think critically about hard issues. What I love about The Amazing Age of John Roy Lynch is that it shows children a hard period in American history and doesn't flinch away from it. More than that, it asks the reader to think about how these systems of inequality impact the world we live in today. Barton's prose is unflinching... For instance, he notes that Lynch's father, a white overseer, "may have loved these slaves, (but) he mostly likely took the whip to others." He keeps the story moving at a rapid clip, while providing enough detail to give young readers a window into what may be an unfamiliar time. There is a wealth of information here. Don Tate's illustrations show Lynch's suffering and his joy, and convey his personality, too. The Amazing Age of John Roy Lynch ... is beautifully executed, interesting, and not to be missed. Literary Friendships: I Got You Chris Barton for Christmas! Enjoy! Mississippi Library Commission Reference Blog: Happy Birthday, John Roy Lynch!